October 16, 2015 – Just before the 15th anniversary of continuous human presence on the International Space Station, U.S. astronaut and commander of the current Expedition 45 crew, Scott Kelly, is breaking spaceflight records. 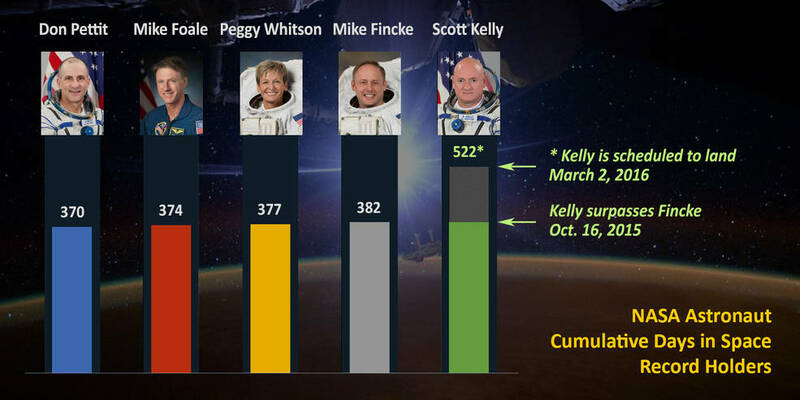 On Friday, October 16, Kelly spent his 383rd day living in space, surpassing U.S. astronaut Mike Fincke’s record of 382 cumulative days. Breaking such a record for time in space is important because every additional day helps us better understand how long-duration spaceflight affects bodies and minds, which is critical to advancing NASA’s journey to Mars. Fifteen years of living and working off the Earth also is improving the quality of our lives here on Earth as scientists and engineers apply the knowledge gained from investigations aboard the unique microgravity laboratory. Kelly will break another record October 29 on his 216th consecutive day in space, when he will surpass astronaut Michael Lopez-Alegria’s record for the single-longest spaceflight by an American. Lopez-Alegria spent 215 days in space as commander of the Expedition 14 crew in 2006. Each additional day in orbit as part of the one-year mission along with cosmonaut Mikhail Kornienko, Kelly will continue to add to his record and to our understanding of the effects of long-duration spaceflight. The pair arrived at the space station in March and are participating in studies during their 342 days in space that provide new insights into how the human body adjusts to weightlessness, isolation, radiation and stress of long-duration spaceflight. 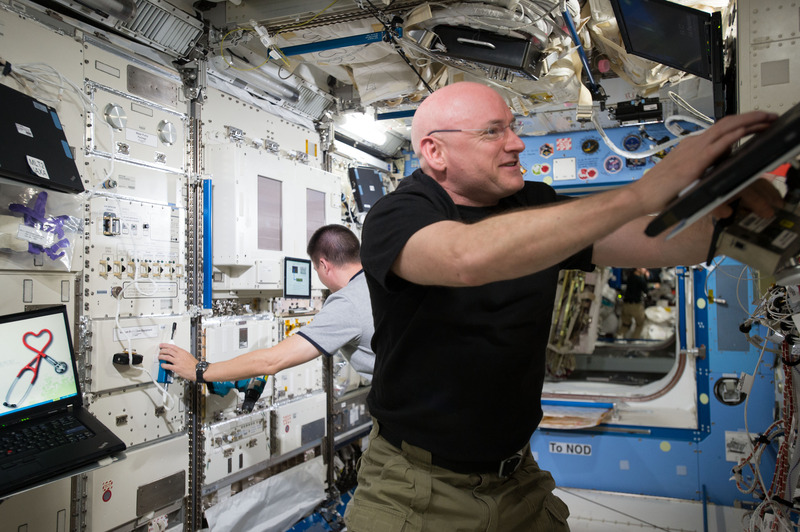 Kelly’s twin brother, former astronaut Mark Kelly, will participate in parallel twin studies on Earth to help scientists compare the effects on the body and mind in space. The investigations in progress on the space station will help scientists better understand how to protect astronauts as they travel into deep space and eventually on missions to the Red Planet. The strong U.S.-Russian collaboration during the one-year mission is an example of the global cooperation aboard the space station that is a blueprint for international partnerships to advance shared goals in space exploration. Strengthening international partnerships will be key in taking humans deeper into the solar system. Kelly is scheduled to return to Earth on March 3, 2016, by which time he will have compiled 522 total days living in space during four missions. Kelly is not the only human breaking records for time in space. Expedition 44 commander Gennady Padalka broke the 10-year-old record for the number of cumulative days in space June 28, as he reached 804 days in space. When he returned to Earth September 11, Padalka had spent 879 days living and working in space. Kelly, Padalka, and the more than 200 people who have visited the space station are contributing to the development of capabilities to enable a sustainable human presence in deep space.